In the UK we’re lucky to have access to the NHS; however this privilege doesn’t extend across the globe. It’s estimated that at least half of the people in the world do not receive the health care services they need. That’s why this year’s World Health Day campaign focuses on universal health coverage and ensuring everyone can get the care they need, at the time they need it. Back in 1948, the World Health Organisation (WHO) decided upon the idea of World Health Day, with affect from 1950. Each year on 7 April the campaign focuses on a different health theme, aiming to raise awareness of it. The theme for this year’s World Health Day is universal health coverage: everyone, everywhere. The campaign aims to highlight the fact that health is a human right, yet there are still so many people who aren’t receiving the health care they need. With it estimated that 100 million people are pushed into extreme poverty every year due to out-of-pocket spending on health, the WHO are taking the opportunity to remind world leaders that everyone should have access to affordable health care. 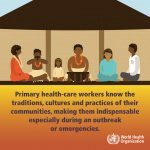 The WHO aims to stress the importance of primary health care; “caring for people, rather than simply treating specific diseases or conditions”. Covering many of the health needs you’ll have throughout your life, including vaccines, tips on preventing diseases and family planning; primary health care is a fair and cost-effective step towards universal health coverage. If you’re looking for ways you can get involved, why not join the World Health Organisation’s Solidarity Chain movement. Another way you can contribute to the campaign is by raising awareness in any way you can. Tell others about the importance of universal health coverage, speak to your local health worker about the campaign; make your voice heard!